So Cirque Du Soleil comes through Boston every year or two with their traveling show. I've seen my fair share of shows over the past several years: Quidam (my favorite), Dralion, Corteo ... now they're going to be coming to Boston in September with their new show Kooza. 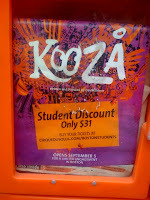 Just in the past few weeks, I've seen some posters around the city advertising student discount tickets for the show for $31. The tickets are normally $55, but with your student discount you can get them for $31. Not too shabby. *Available to Students only. Need to show valid student ID upon entrance to the Grand Chapiteau. Not available on previously purchased tickets. Click (here) for a link to the special Cirque website. PS. Yes, I know all of you students just finished classes and are hoping to enjoy the summer and the last thing thing on your mind is coming back in September. BUT, if you haven't seen a Cirque show, I recommend you check it out. 0 Response to "Cirque Du Soleil Student Tix for $31"